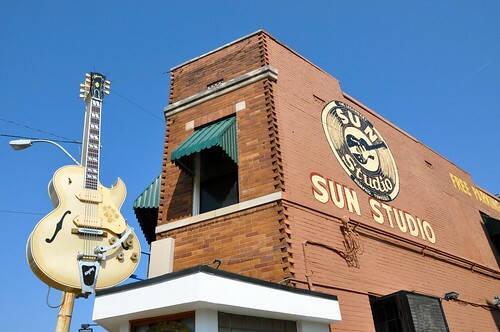 Would you believe that we weren’t even planning on going to the Sun Studio tour while we were in Memphis? Wacky, huh? But when we saw this gigantic Gibson glowing in the morning sun, we had to investigate. So glad we did, as the tour ended up being a highlight of our entire visit to town. I just got a nice note from photographer John Woolf – his exhibit of 20 diner and roadside photos on display at the National Heritage Museum in Lexington MA (which I always mistakenly refer to as the Museum of Our National Heritage) – has been extended! The Hukilau Tiki Fest at the Mai-Kai Ft. Lauderdale FL – Celebrating 10 years of Polynesian Pop June 9-11, 2011! 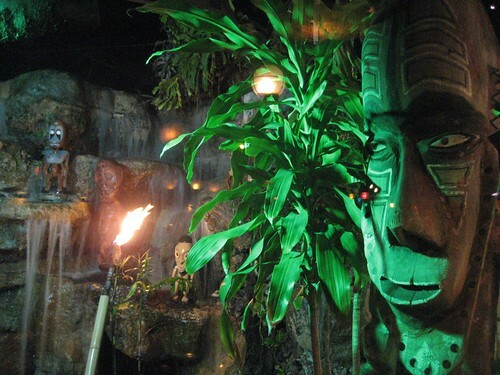 This year marks the 10th anniversary of The Hukilau “- an annual event celebrating Hawaiian and Polynesian Pop culture while honoring a historic Tiki bar and location.” And what better place to celebrate than at the tiki-tastic Mai Kai in Fort Lauderdale, FL. Say Aloha to mid century tiki fun! RetroRoadhusband and I are not able to attend this year’s Hukilau, but based on the rave reviews of the event and the Mai Kai (where the Hukilau has been held these last many years) we made a special trip to Florida’s east coast last year specifically to check out the Mai Kai, and we had a fabulous time! You can read all about our visit to The Mai Kai here. The Hukilau is named for the traditional festive feasts celebrated on the shores of Hawaii and meant to emphasize the spirit of family and community, or ‘ohana. Sled Fest 4/30 – Old Sledworks Antiques Duncannon PA 20th Anniversary – RetroRoadmap will be Representing! 20 years in the making – and RetroRoadmap will be there! Regular readers may recall our fun visit to the Old Sledworks Antiques in Duncannon PA (and lunch at The Red Rabbit Drive In up the road) and now we’re heading back there for a day of vintage retro fun on Saturday April 30th. Tasty food and drink concessions. Event Co-sponsored by Retro Lovely Magazine. Meet Sleighmate winner Kelly Welsted from Buffalo, NY and watch her photoshoot for Retro Lovely Magazine, the hottest pinup mag on the planet! Read more about all the cool stuff going on at Sledfest – click here! I don’t know about you, but any time I hear music from the 1930’s and 1940’s – Glenn Miller, Benny Goodman, Artie Shaw – it makes me want to dance! 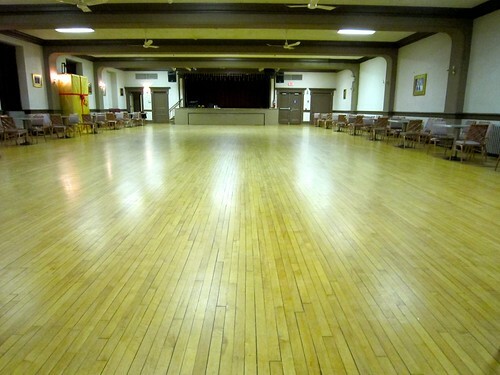 So when I found out a while ago that Swing Kat Entertainment was offering swing dance lessons and live music dances in a vintage building in Pottstown PA, I packed up my dancing shoes and shuffled off to the ballroom – with a VERY reluctant RetroRoadhusband in tow. He’s a good egg but even he has his limits. 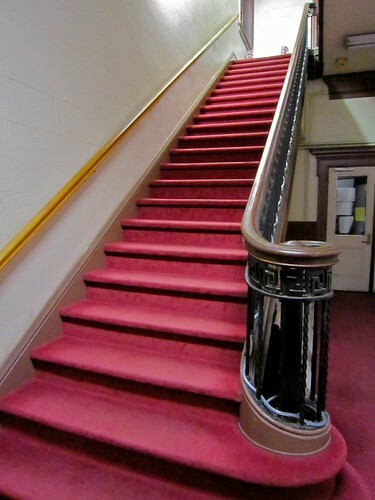 The ballroom is on the 2nd floor, so climb the stairway to paradise along with me! 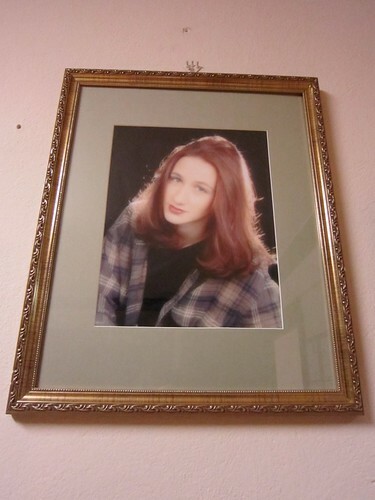 The dance lessons with RetroRoadhusband were a disaster, so I had not been back here in a while, but I recently met with Faryl Codispoti – founder of Swing Kat – so I could learn more about what went on in the ballroom so I could share it with you RetroRoadmap Readers. One thing I remembered from when we took lessons was the story that Faryl told us about his motivation to start Swing Kat. He had never really danced at all until he was 25, when his sister was diagnosed with a terminal illness. She loved to dance so in the last few months of her life she and Faryl learned to swing dance together, bringing joy to both of them and fond memories to him. He’s been dancing ever since and teaching dance since 2003. I’m happy to report Swing Kat will be celebrating their 5th anniversary of dancing at The Ballroom on High this September. 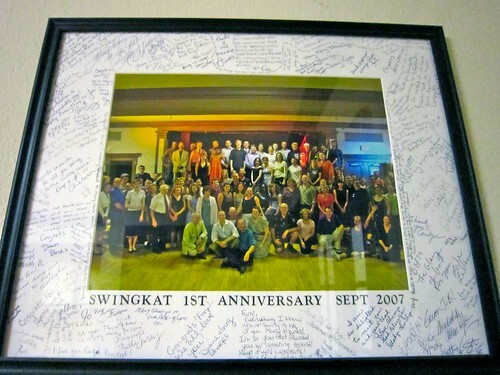 Not only do they teach swing lessons but Jitterbug, Charleston, Balboa, along with Ballroom, Country, Salsa and more. Everyone here is very friendly and welcoming even if you’ve never danced before, and Faryl says that’s what keeps people coming back to the ballroom. While they may be reluctant or shy at first, the comfortable environment and friendships made make the ballroom someplace to look forward to going. 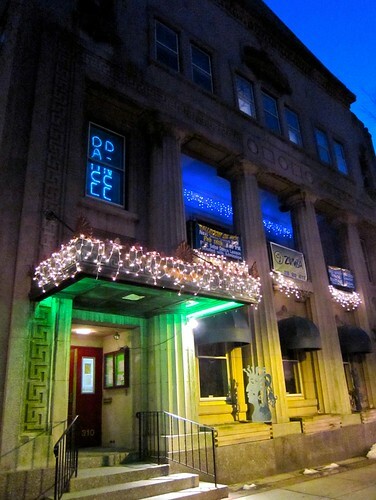 The ballroom itself is in a grand building on High Street, the main street in Pottstown. Built in 1928, it was originally a Fraternal Order of the Eagles building. You can rent the ballroom for weddings or other events, with room for a live band on the stage and plenty of floorspace. One thing I think is so great about this whole scene is that live band perform at the dances held every third Saturday of the month. The lessons and dances attract folks of all ages, from high school students (there are light refreshments included in admission price, but no alcohol served) all the way up to folks in their 70’s. I was charmed to hear that there is a 93 year old gentleman who comes to the dances and just sits and watches the band and enjoys the evening. If you’re not sure of your skills there is a lesson offered before each dance, ranging from beginner steps for newbies, to more advanced skills for those who have been around Swing Kat a while. So while you may not think you can dance, who knows, you could be the next Fred Astaire or Ginger Rogers! I’m tres jealous of all the folks down in Florida – not only b/c of the weather, but because I would so love to go to the Floridiana Festival & Highwaymen Artist Show in St. Petersburg on Saturday 1/29. 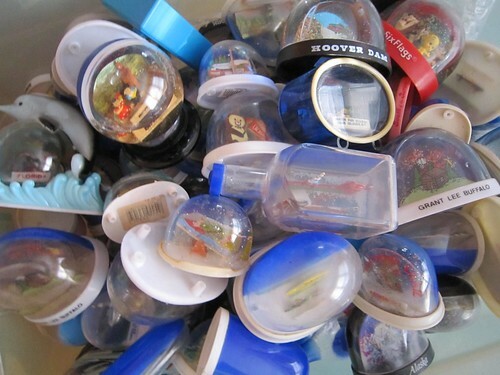 I’d much rather take a look at the vintage Florida souvenirs, art, kitsch, memorabilia, and historical artifacts, than checking the weather reports to see if snow will put the kibosh on my weekend plans! The 10th edition of this popular kitschy Florida “antiques & collectibles” event returns to St. Petersburg for its 10th edition on Saturday, January 29, 2011, from 10 am to 5 pm at the historic Garden Club of St. Petersburg. Featuring old Florida souvenirs and memorabilia for sale, spanning the range from alligator ashtrays, flamingo figurines, and citrus-shaped radios, to postcards and other fun ephemera from the Sunshine State’s old parks and hotels, the Floridiana Festival brings together premier exhibitors and collectors of vintage Floridiana, clamoring to be the first ones to discover some unique Florida finds. Serious collectors will enjoy the selection of alligator memorabilia and souvenir sterling silver spoons and hotel china from Florida’s “golden age of souvenirs,” while more casual collectors of kitsch can find postcards of bathing beauties and old tourist attractions, alligator purses and other Florida fashion. Kitsch rules at this show, definitely, but for decorators looking for some serious, vintage tropical furnishings, it’s also a hot spot to pick up some old rattan, tropical lamps, and beautiful wall art. – Lectures, slide presentation and book signings by Florida Authors…PLUS you just might meet some of the original mermaids who will be on hand to discuss their time at Weeki Wachee! The Garden Club of St. Petersburg is located at 500 Sunset Drive South, at the intersection of Park Street and 5th Avenue South in St. Petersburg, near the western end of Central Avenue close to the bridge over to Treasure Island. Show admission is $6.00; children under three years are $3.00. Free parking.